The video is directed by Director Loïc Prigent & Fabien Constant. “Kitsuné Maison 9” will be released April 26, 2010 on Kitsuné. Pick it up on iTunes, Amazon, Beatport, eMusic, and other fine digital outlets. Dopamine Promo from Hidden Recordings on Vimeo. Hidden Recordings welcomes up & coming Washington DC-based producer Jubilee to their roster with the delightfully sinister Dopamine EP. Featuring remixes from Thoughtless Music’s Noah Pred and Hidden’s own in-house production team of Deepak Sharma & Dieter Krause, this single is the first in a series of quality releases from the label due out in 2010. This release is comprised of two original Jubilee compositions: “Dopamine” and “Histamine”. The pair of tracks are remixed by Pred and Sharma & Krause respectively. New York City’s Hidden Recordings has provided a wide range of techno to hundreds of DJs and fans since 2006. The label’s sound ranges from deep techno to atmospheric chill-out with quirky grooves and has been played everywhere from big room gigs and festivals to smaller lounges and early morning terraces. A loping Philly-style house bass line and tight vocal editing give this track a warm, funky feeling that bounces. Handclap sounds gives the original a nice dynamic and a complete, organic touch that falls somewhere between main room funky house and its deeper, late night cousin – tech house. Pred carves a different path on his re-working with a darker, noisier vision that is more in line with his own Thoughtless imprint’s interpretation of techno. Science fictional machinations whirl around deep synth pads and a much less amiable version of Jubilee’s original bass line. The results will have dance floors treading through a syrupy haze of early AM speaker dust. On “Histamine”, Jubilee takes a more synthetic approach with buzzsaws of ascending minimal beats and a skeletal bass line pounding out a relentless and dreamy groove. The insistent pulse here compels listeners like a irresistible siren song. Label founders Sharma and Krause knock one out of the park on this wicked slice of assembly line techno. Detroit and Dusseldorf techno influences battle it out for supremacy on a tough-as-nails production from this talented duo. Born in Casa Blanca, Morocco, Jubilee grew up listening to his father play instruments and old records. Ten years ago, Jubilee came to the U.S.A., bringing his culturally infused sense of rhythm, beats, and sounds to the streets of DC as a club promoter for Panorama. His interest in becoming a DJ started when he would watch the DJs play for 6 hours a crack, just watching every movement, learning. In 2001, DJ Alex Kelly was playing at DC’s former club, Spot. Jubilee was watching him play until the DJ handed the headphones over. Stunned and feeling like a daydream, Jubilee put on the headphones and started mixing. Daylight couldn’t come faster. As soon as he could, Jubilee went out and bought about ten records and asked Alex if he could open for him until he got to the club. Shortly after, he bought his first turntable set. Everyday, Jubilee would just play the records over and over and over again. Listening. Feeling the sound and making it work. Jubilee has been creating impressionable sounds over the past two years, gearing toward becoming one of the music’s up and coming artists. Between his live performances and unique DJ sets, Jubilee has created quite a following in DC, earning credibility with some of the industry’s top venues. Support has been a phenomenal instrument is generating Jubilee’s success. With pal Gabriel Rojas and residency with Mnmlife, Jubilee has put together events premiering local and global talents and played with artist such as Josh Wink, Adultnapper, Mr. C, and Matthias Tanzmann. The more you follow, you’ll see it’s more than just music. Producing dance music and performing live for the past ten years, Noah Pred emerged from Vancouver’s underground as a sought-after techno DJ with a sophisticated sound and unique style. Devoted to authentic and soulful strains of techno in all its permutations, Noah’s sound continues to evolve while remaining firmly driven by the dance floor. 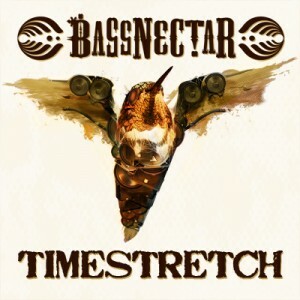 Since his first records were released, his productions have received international support, garnering critical acclaim while moving dancefloors across the globe. As a DJ and live act, he’s toured throughout Europe and North America, performing alongside such diverse artists as Josh Wink, Mathew Jonson, and James Holden. After a three-year stint in Montreal working for Consigned Recordings while holding a residency at Stereobar, Noah relocated to the West Coast to produce his field recording based techno full-length, ‘Ecocosm’, which was soon released on New Kanada. Exploring his compositional versatility, Pred launched the Shen project in 2004. Geared towards digital downtempo, electronic dub and emotive IDM, Shen provided a creative outlet for productions that roam beyond the borders of clubland. Noah’s debut Shen full-length, ‘Outlines’, was released on Native State Records in late 2006. Now based in Toronto, Pred has developed a loyal and devoted following for his potent DJ sets while running the digital imprint Thoughtless Music from his studio headquarters. The press has taken notice of Deepak Sharma and Dieter Krause’s rising popularity, with DJ Times placing them on the cover of the April 2009 issue along with a feature piece on the label. AOL Music’s Spinner.com compared their sound and style to minimal techno giants Lusine, Superpitcher, Booka Shade, along with Alex Smoke and Gui Boratto. In addition, they have been reviewed in prominent magazines such as XLR8R, DJ Times, Time Out New York, MixMag (UK), Trax (France) and Raveline (Germany). Support has come from all over the globe, with major artists such as Pier Bucci, Butane, Argenis Brito, Alexi Delano, Maetrik, Ambivalent, Barem, Noah Pred, Gregory Shiff, Patrick Bateman, Derek Plaslaiko and Eric Cloutier all supporting the duo’s music. Another track from Dam-Funk’s free download series. Straight from the lab & unmastered, the tentatively unreleased “Do U Feel The Same Way I Do”. Dâm-Funk Interview Special from DAMIEN NEVA on Vimeo. 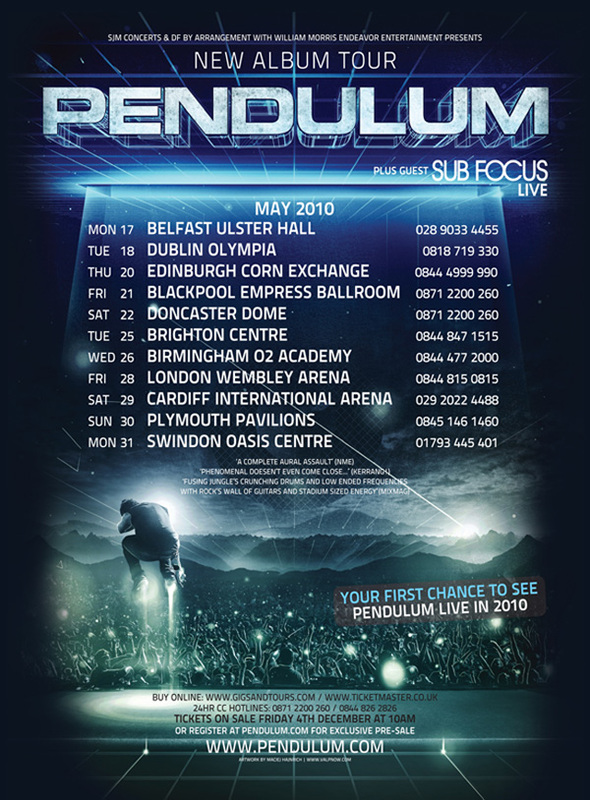 Pendulum are a revolutionary Drum and Bass Rock band who incorporate both scenes to create the ultimate in music, After originally coming across from Australia to live at a friends house with next to nothing they have now taken the worlds music charts by storm with some excellent music. Pendulums first album Hold Your Colour which sold millions of copies has some of the now legendary club anthems including Slam, Tarantula and Sounds of Life. They didn’t stop there though, they have mixed all types of music genres from Coldplay’s Violet Hill to Metallica’s Master of the Puppets to one of their more recent remixes of Plan B’s Stay too Long. Their second album In Silico featured a different sort of tone incorporating more rock and electronic into the songs instead of the more recognised drum and bass. Preorder and Buy Pendulums upcoming third album Immersion first here. Official video for Rusko’s Woo Boost! Single plus remixes at itunes now – http://bit.ly/cR6J7H Look for Rusko’s debut album, O.M.G.! out on Mad Decent, May 2010.